Our latest revision has been updated with a new body ribbing design which allows for better compatibility with aftermarket mag couplers, a new follower which provides even smoother loading with military stripper clips. 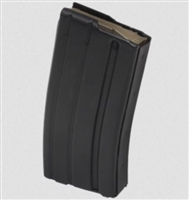 The PMAG MagLevel features transparent windows on both sides of the body and has a painted indicator on the spring for quick determination of approximate rounds remaining in the magazine. Our latest revision has been updated with a new body ribbing design which allows for better compatibility with aftermarket mag couplers, a new follower which gives even smoother loading with military stripper clips. Along with larger windows and round count numbers on the body, the PMAG MagLevel's stainless steel magazine spring is now coated with mil-spec black oxide and the indicator coil painted with a high visibility orange color.